It was the job of photographer Léon Crémière (1831-1913) to photograph the members of the “Maison de l’Empereur” [the Emperor’s Household], and the shot here is his magnificent portrait (1861) of Émilien de Nieuwerkerke, an essential figure in the artistic life of the Second Empire, who at the time had been intendant des Beaux-Arts since 1853. Whilst it is a fairly classic portrait, Nieuwerkerke’s very theatrical expression give it an odd piquant atmosphere. 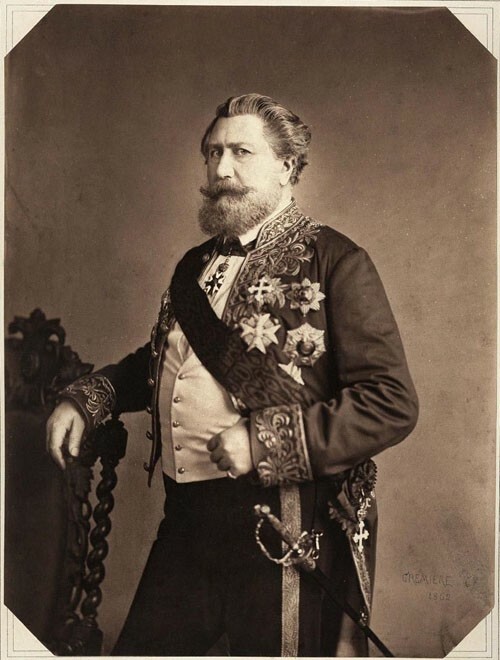 Comte Emilien O’Hara de Nieuwerkerke cut a flamboyant dash in the Second Republic and the Second Empire, and his role for Napoleon III was similar to that played by Dominique-Vivant Denon for Napoleon I. It was in 1845 that the Dutchman Nieuwerkerke (who took French nationality in 1849) met Princess Mathilde (1820-1904), the cousin of Louis-Napoleon Bonaparte, the future President of the Second Republic, subsquently Emperor of the French. Mathilde was unhappily married to the Russian Anatole Demidoff, Prince of San Donato, but from 1846 to 1869, she became Nieuwerkerke’s mistress, thereby rendering secure Nieuwerkerke’s career as an artist and more importantly as an administrator. Nieuwerkerke himself had been married to Marie Técla de Monttessuy (1810-1886) since 1832. The couple was invited several times to the “séries de Compiègne” [a succession of invitations each lasting a week which took place over a period of several weeks every year, when important personalities joined the Imperial couple at the Palais de Compiègne]. 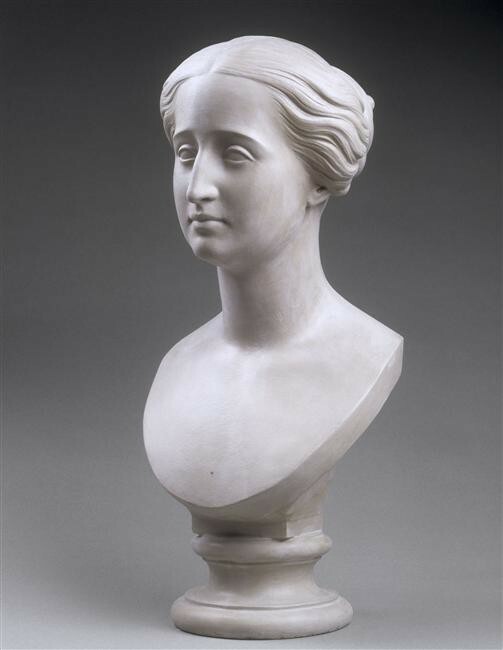 After studying under James Pradier (1790-1852), Nieuwerkerke became a sculptor in the academic tradition. He exhibited at the “Salons” of 1842, 1843, 1846 (a bronze bust of René Descartes), 1847 (6 works including a plaster statue of La Reine Elisabeth la Catholique entrant à Grenade [Queen Elizabeth the Catholic entering Granada], 1849, 1855, 1855, 1857, 1859 (a bust of Princess Murat) and 1861. He also made a statue of Napoleon I on horseback for the town of Lyons (1850-1852, but which was destroyed in 1870-1871), a copy of which was commissioned by the town of La Roche-sur-Yon (1852-1854). In 1852, he also realised busts of the Prince-President, the Princess Mathilde, and the young Eugenie de Guzman Palafox y Portocarrero, which, slightly modified, became the official portrait bust of Empress Eugenie (external link in English). But Nieuwerkerke was obliged to abandon his own artistic practice because of his numerous other responsibilities and appointments: he was made Director General of National Museums in 1849, Intendant des Beaux-Arts of the Emperor’s Household in 1853, Honorary Chamberlain of the Emperor in 1859, Surintendent des Beaux-Arts in 1863 (a position from the Ancien Régime that was restored for him). He was also elected a free member of the Académie des Beaux-arts [Academy of Fine Arts] in 1853, Vice-President (in 1855) and President (in 1856) of the Société des Antiquaires de France (Society of Antiquaries of France), senator (by a decree of 1864), Vice-President (in 1863) and President (in 1865) of the Commission des Monuments historiques [Commission for Historic Monuments]. In his capacity as head of three museums (Louvre, Luxembourg, Versailles), he played an important role in the creation in 1862 of the Musée des Antiquités Gallo-Romaines [the Museum of Gallo-Roman Antiquities] at Saint-Germain-en-Laye. He was in charge of the collections of the Imperial Museums, was responsible for commissioning paintings, sculptures and engravings (for the civil list) as well as for the organisation of the annual “Salon”. He was instrumental in passing through the difficult reform of the Ecole des Beaux-arts [Fine Arts School] (in 1863) and in 1864 founded the Union Centrale des Beaux-Arts appliqués à l’Industrie [Central Union of Fine Arts Applied to Industry]. Nieuwerkerke was therefore an influential man at the crossroads of the artistic and political circles, however he would lose his position as Surintendent des Beaux-Arts, when that department was replaced by the Ministère des Beaux-Arts [Ministry of Fine Arts], and the Republican Maurice Richard was nominated as it head. The Count was then given the more modest role of Surintendent des Musées Impériaux. When Nieuwerkerke learnt of Napoleon III’s surrender at Sedan on 3 September 1870, he quickly resigned (on 5 September) and managing to escape to England, narrowly escaping being arrested. In late 1871, he went to Italy, settling in Gattaiola near Lucca, where he died in 1892. 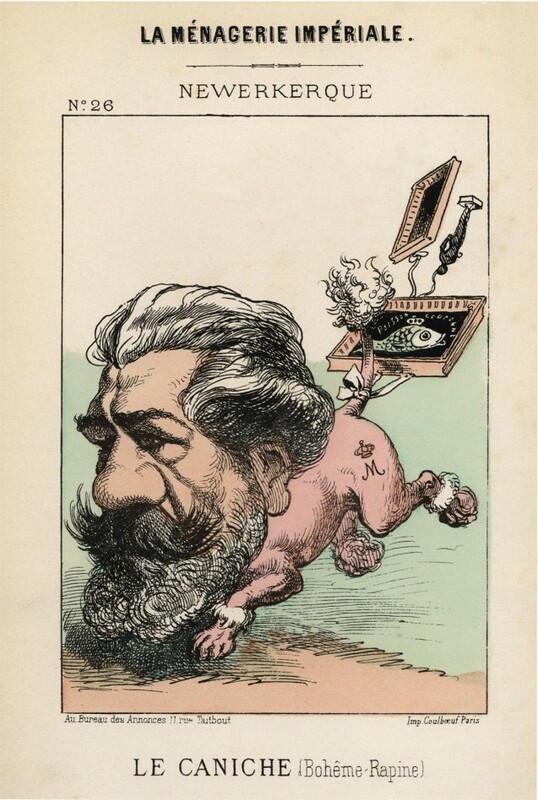 A caricature of Nieuwerkerke in the album “La Ménagerie impériale” [the Imperial Menagerie] depicts him as a poodle tattooed with an “M” surmounted by a crown (symbolising his relationship with Princess Mathilde) with a small statuette and two paintings tried to its tail. [One of these paintings represents a “poisson couronné”, (a crowned fish) probably in reference to a “poisson d’avril”, a popular trick traditionally played in France on April Fool’s Day (1st April) by children who try to attach a paper fish to someone behind his back in order to poke fun at him]. The Crémière album, which was acquired by the Fondation Napoléon in 1995, is composed of forty photographic plates representing personalities of the “Maison de l’Empereur” [the Emperor’s Household], a unique testimony to the men who also helped to create the Second Empire in the shadow of the sovereign. Léon Crémière was at that time the official photographer of the “Maison de l’Empereur” and had a photographic studio at 28 rue de Laval (renamed “rue Victor Massé” in 1887) in Paris’s 9th arrondissement. An album of photographs of animals from various institutions of the “Maison de l’Empereur” (the Vénerie, the farm at Vincennes, the Zoological garden, etc.) (a portfolio of 37 positive photographs printed on albumin paper from collodion glass negatives).